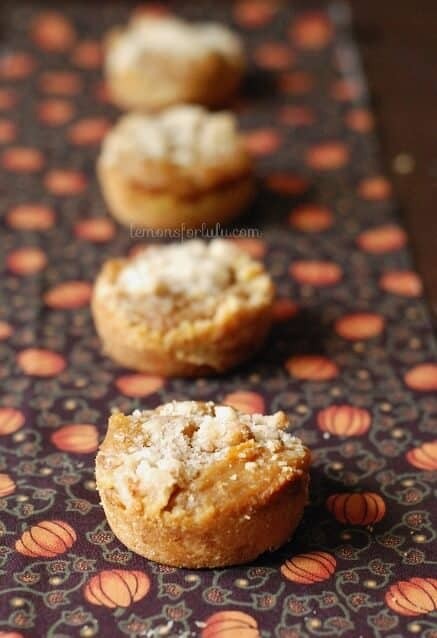 Pumpkin pie flavor in a little cookie cup! I love fall birthdays. In our family, we celebrate two. My oldest just turned 10 and my youngest will soon turn 5. These months always hold a special place in my heart. Plus, parties seem to be way more fun in the fall! I vividly remember going to a friend’s Halloween costume birthday party back in elementary school. My sisters both assisted me in creating the most ingenious costume. I was a bag of jelly beans. I was enveloped by a clear bag full of colored balloons. My best friend was an Oreo. We were a sweet little pair! Out of all the birthday parties I attended as a kid, this one stands out the most. We had a costume judging contest, we danced to the “Monster Mash”, we bobbed for apples (a first for me), we ate Halloween themed food and went through a haunted house in the basement. By the end of the night, all my balloons had popped and the clear bag was torn. But I didn’t care. I had the best night of my life! Yes, there’s just something about a fall birthday. Heat oven to 350. Grease 24 muffin cups and set aside. In a large bowl cut butter and cream cheese into sugar cookie mix until it is crumbly. Reserve 1 cup of mixture, add cinnamon and set aside. Scoop remaining mixture, two tablespoons at a time, over the bottoms of each muffin cup. 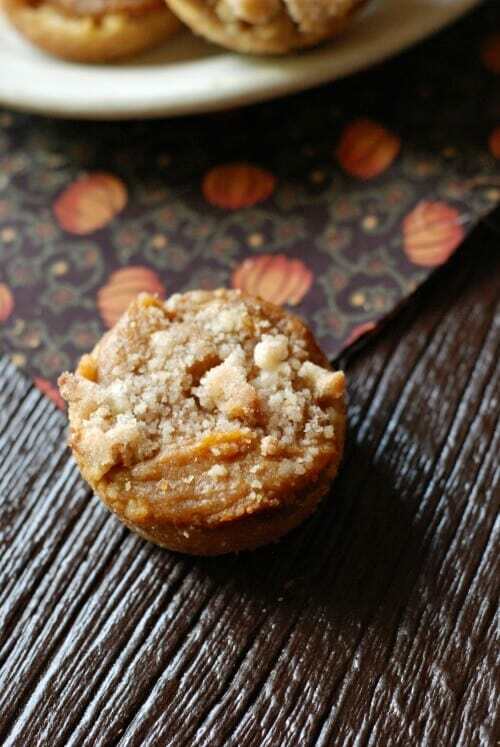 In a separate bowl, combine softened cream cheese, pumpkin filling and Biscoff stirring until smooth. Add the remaining ingredient and stir until blended. Place a generous scoop of filling onto each cookie crust. Top each cup with 2 teaspoons of reserved topping. Bake for 18-20 minutes or until edges are set and golden brown. Let cups cool in pan completely. To remove, run a knife or spatula around the edge of each cookie to loosen. YES! Tanya I love this!!!! And Happy Birthday to Julie, yay! 24 mini muffin cups or 24 regular size cups? Tanya, these look SO good! 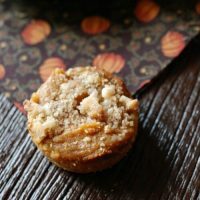 I am totally loving all of these fabulous pumpkin recipes!! So glad Julie picked a pumpkin birthday! Pinning of course! 🙂 LOVED the costume story, I’ll just bet you were an adorable bag of jelly beans! Hope you are having a wonderful day! Pumpkin is the best isn’t it Cindy? Thank you! If we didn’t devour them, I’d send you some Paula! These cookies look so, so good! 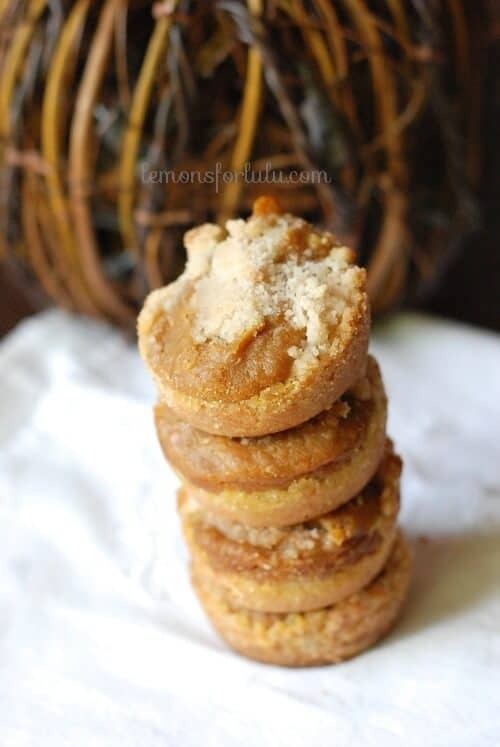 You have combined all my faves into one cookie- sugar cookies, pumpkin pie, & cookie butter! 🙂 And I love how easy they are! They are my favs too Carrie! These look so good, and I love that they are bit size desserts. I bet the combination of biscoff and pumpkin is to die for! Great recipe Tanya.. Pinning. These look so yummy! 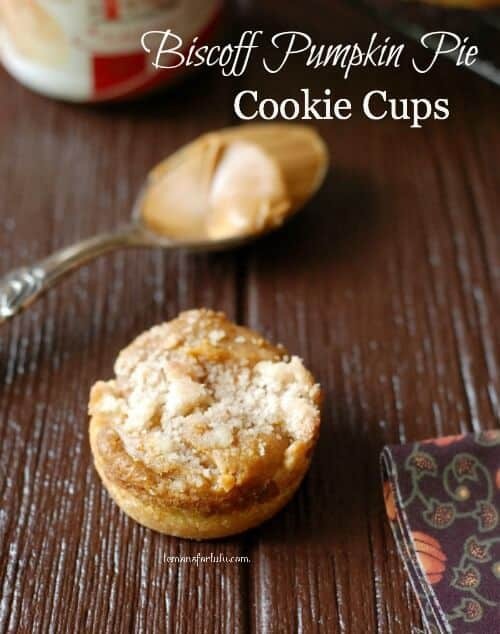 Another great use for cookie butter! Can’t wait to try these! 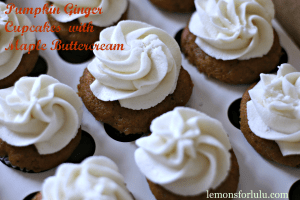 I could find so many great uses for cookie butter! Thanks Diane! Tanya these look so yummy and adorable! What a busy bday month for you! It does sound fun, though! I have to say, I recently purchased the last jar of Biscoff in our small town grocery store…and my very first time trying it. I was immediately addicted. I went back and they can’t order it for another month!!! Can you believe that?! It’s the only store in the whole county! soooo, when they get some in, I really want to make these! Pinning! Oh my goodness! Pumpkin + biscoff sounds amazing! Never would have thought of that but it seems so genius and delicious! They go extremely well together Erin! Tanya, you have taken two of my favorite things and made one fantastic treat! I absolutely love these and cannot wait to make them! Thank you so much for making these for my birthday celebration. Pinning and sharing on social media. Have a wonderful day! Thanks Julie! Hope you had a great birthday! They look so so good, I love how you can see the biscoff on the top. I love the Biscoff too! Wow – these look fantastic and wish I had one while drinking my coffee now! Pinned! I’m sure Julie loved them! Ha – I pinned these and shared them on Buffer yesterday and then forgot to comment! These are adorable and they look so delicious. I seriously need to try this Biscoff stuff!! They look awesome, Tanya! Claire, I truly eat it by the spoonful, its so good! I have never heard of Biscoff. What is it? I need to try Biscoff – thanks for sharing this delicious recipe! You do! But it is so addictive! These look so tasty. I have just recently fallen in love with Biscoff and can only begin to imagine what a fantastic combo this recipe is. Making soon! Thanks so much for sharing at Weekend Potluck. Please come back soon. This might be my new favorite combo Marsha! Biscoff is the best isnt’ it? Yummy, yummy! Pumpkin + Biscoff = love. Can’t wait to try these! Pinning, I’m so excited to make these! Biscoff and Pumpkin? A match made in heaven! Genius idea! Although, I’d sit there and just eat them out of the muffin tin until they were gone. Haha Dawn, I was tempted to do that! These look heavenly Tanya! My little one is turning five next week and I’m having a little bit of a hard time dealing with that 🙂 These just might make me feel better! Pinned! Is it pumpkin puree or pumpkin pie filling in this recipe? Three of my favorite things: pumpkin, biscoff, and cream cheese! Can’t wait to try them. Pumpkin puree. I love all three too! 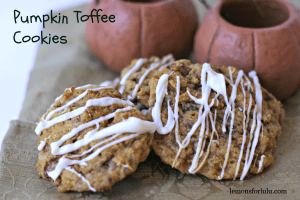 A great combination of flavors-love using Biscoff in cookies! I too would like to know if mini muffin or regular muffin size pans are to be used?? These look like the PERFECT little bites!! I have to say, I recently purchased the last jar of Biscoff in our small town grocery store…and my very first time trying it. I was immediately addicted. Welcome to Biscoff! You can never go back, it’s the BEST! It truly is the truth is an incredible as well as useful little bit of information and facts. Now i’m grateful that you simply distributed this useful information with us. You need to keep people informed like that. Thank you giving.